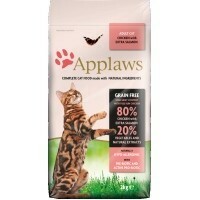 Applaws Adult Dry Cat Food (Chicken with Salmon) is a grain free complete cat food made from only 100% natural ingredients. Containing a high meat content of free run chicken and extra salmon, the food has been bolstered with 20% vegetables and healthy natural extracts. Applaws Adult Cat Food is also naturally hypo-allergenic and full of pre-biotics and pro-biotics to support your cat’s health. Pre-Biotics / Pro-Biotics – Helps support a healthy immune system and encourages beneficial gut flora. My cats like this food very much. It is palatable and economical to feed. I love this brand, it is one of my favourites and it seems to be one of my cat's favourites too! It is very natural, grain free, with 3% of salmon oil, and also with cranberry, kelp, yucca, rosemary... that will help your cat system and digestion. I am really pleased with this dry cat food. My cat loves it, and the 2kg bag lasts for ages (I give it in addition to meat), so is good value for money. I am very health conscious myself, and try to eat organically, so I like the fact that this product is natural, and with no additives or anything artificial. A very healthy food for my beloved baby ! The service is always excellent - delivered very promptly and efficiently, and the website easy to use and products easy to order.